Some incidents tickle the tender innocence most of us leave behind when entering maturity of age. I experienced this days ago while watching few episodes of Malgudi Days – the serial most of the 90’s kids in India grew up watching. Every story increases your longing to visit the enchanting Malgudi, only to find no real place called Malgudi on the face of earth but a literary child of R.K.Narayan. Malgudi is a potpourri of characters portraying simplicity, mystery, typical human cunningness and a strong longing for earthly life. Here’s a writer, who we find, is distinct from the popular image of a writer. He went through all situations a common man is expected to face, without posing escapism as artistic freedom: acting as a school teacher, news reporter, writing for a matrimonial magazine, working on a project commissioned by his state only to lose his money in bureaucracy. 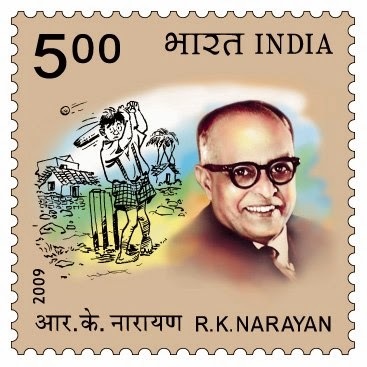 R.K.Narayan’s life is like a monograph on the irony of human life. Aren’t there times you miss your ever nostalgic childhood? It gave us space and time to discover things for ourselves, first hand, without a ‘Book for Dummies’ handbook. Today, with abundant information shaping everything children do, a space free of compulsive activities can work wonders in their developing years. It is this environment that shaped Narayan’s life. His was a peculiar childhood spent in the company of a range of pets including a peacock, monkey, mynah, parrot, kitten and puppy. A caring grandmother made up for the interest he lost due to his dull school environment. The school library played an important role in shaping his literary tastes. During summer, the library would be open at all hours even on odd days. Narayan and his elder brother competed with each other in reading, unaware of the time and seasons. Wasn’t this enough for the foundation of success assured literary career? His first attempt to publish his work faced rejection. He failed his university entrance examination in English. He started freelancing by writing book reviews, writing short stories and working as a newspaper reporter in Mysore. When his literary work took off, his wife bid adieu to life at an early age leaving behind a three year old daughter. To quote him on death, “If you have to accept life, you are inevitably committed to the notion of death. And yet one cannot stop living, acting, working, planning – some instinct drives one on.” Loneliness gripped him and he stopped writing for a span. This later phase shaped his philosophical understanding of life. An interesting account of his life belongs to this period. He had many “other worldly” encounters, including some with his deceased wife, which began through an acquaintance who acted as the medium. Narayan could catch telepathic messages and transmit his thoughts to others. This interest gradually diminished and he renewed his literary work with a new zeal. The chapter of his life, after a satisfying career as an author, is interesting as well: He would often write to the civic officials regarding their shortcomings and protecting the trees in Mysore. “Arm-chair” agriculture was one activity he found captivating. Following his curious interest he acquired a piece of land and cultivated it with the aid of an agricultural expert. The strange economics of agriculture amused him. One of the major writers who brought the Indian literature in English to a significant status in world literature, a recipient of the Padma Bhushan and Padma Vibhushan, a AC Benson Medal(awarded by the Royal Society of Literature, UK ) winner concluded his life story in 2001.